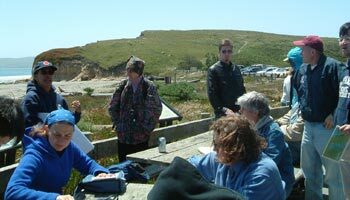 Drake's Beach provided a beautiful place to stop for lunch, followed by a discussion of the Purisima Formation. 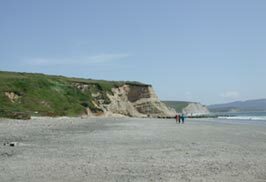 In contrast to the conglomerates we viewed at Stop #2, the Purisima Formation (mapped as the Drakes Bay Formation in older reports) is a fine-grained marine sedimentary deposit that is latest Miocene to Pliocene in age (6-3 million years old). It was deposited on the continental shelf and upper slope when sea level rose after the accumulation of the Pt. Reyes Conglomerate. 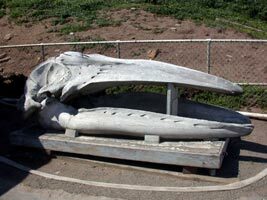 The Purisima Formation occurs in other coastal outcrops in San Mateo and San Cruz counties and varies a lot in composition, texture, and abundance of fossils. 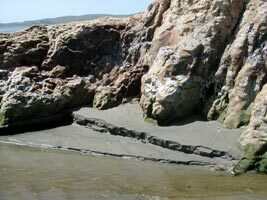 The Purisima Formation at Drakes Bay is a diatomaceous (diatom microfossil-bearing) siltstone and fine sandstone with thin interbeds of mudstone. 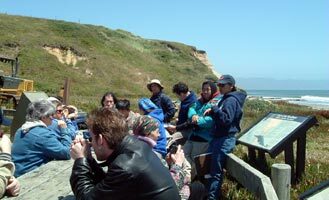 Although macroinvertebrate and vertebrate fossils are rare in this exposure, the Purisima Formation is known to be rich in bivalves, gastropods, echinoderms, sharks teeth, and marine mammal fossils. Sedimentary structures visible here include burrows (bioturbation) and faint cross bedding. 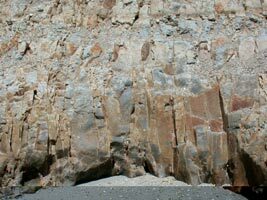 The Purisima Formation records the last marine phase of deposition of units on top of granite bedrock (Salinian block). The entire block was uplifted as it was transported northward along the San Andreas fault resulting in the exposures along the Pt. Reyes shoreline. The Purisima Formation displays a number of structures that formed in response to uplift, such as jointing and fracturing. Also visible are many interesting weathering features including iron staining, color banding, and differential weathering of carbonate concretions. Travel on to Stop #4: The Marin Headlands.